There are few athletes in the realm of college football that are athletes like Mariota, who was in the mix to win the Heisman before struggling down the stretch, and few are as great of a fit as he is with his offensive scheme. I think Mariota may just be the finest quarterback in America and I think he will lead Oregon to the College Football Playoff and claim the Heisman. As you can tell, I'm not feeling another Heisman for "Famous Jameis." It's not because he won't have another spectacular season, which I think he will, or that Florida State will disappoint, which I don't think either. 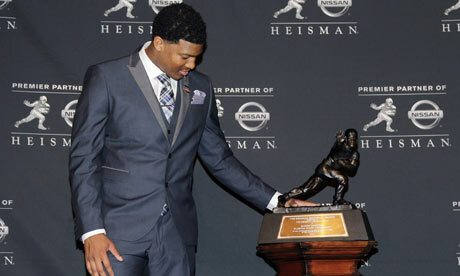 As we all know, it is very tough for anybody to win that second Heisman for whatever reason. Therefore I don't think Winston will win it again but he looks like a lock to be in New York. This Heisman race could come down to two quarterbacks in the same conference and perhaps if either wins the conference and potentially get to the Playoff. If Hundley can lead the Bruins to the Playoff, he may just claim the award. He's a terrific player and he will put up strong numbers. However, I don't know if his surrounding cast is good enough to help him lead UCLA there. If you like numbers, Petty will give you just that. Petty's numbers in Art Briles' system were tremendous last year and they should be again (although could he really threw only three picks again?). And he deserves credit for helping take once-woeful Baylor to greater heights than ever before. However, his surrounding cast will not be as good but the Bears should be in the mix with Oklahoma to win the Big 12. Hey, a running back! Gurley is the best running back in the country (although Melvin Gordon will give him a run for his money) and should he be fully healthy, he will give the Bulldogs big numbers. After all, Uga will be breaking in a new quarterback after Aaron Murray graduated and if Gurley helps lead his team far, and perhaps to the Playoff, he will get to New York and could leave with a nice trophy.